ON TOUR: Guernsey and Aurigny. AND FINALLY: Don’t bother to check the fuselage numbers. Boeing predicts a demand for 36,770 new aircraft over the next 20 years, an increase of 4.2% from last year’s forecast. The company released its annual Current Market Outlook in London last week, prior to the Farnborough Airshow (see Air shows at Farnborough), estimating the total value of these planes at US$5.2tr. With the addition of an eighth Boeing 787 Dreamliner (of 13 on firm order) Ethiopian Airlines has gone daily from Heathrow to Addis Ababa. The airline remains in T3 until 17 September when it joins its Star Alliance colleagues in the new Queen's Terminal. Since its launch in February 2000, Jet Blue, now a major US regional airline, has been innovative. Its latest scheme could literally ‘take off’ and be the norm for airline operations around the world. Jet Blue plans to cancel the check-in! Now in its fourth year, the index, which uses data from 132 of the most travelled cities from around the world, reveals London is projected to receive 18.7m international visitors in 2014. This translates into an injection of over £11bn for the capital in the year. Iberia is now offering OnAir’s inflight connectivity on transatlantic routes. Passengers flying between Europe and the Americas can use the inflight wi-fi and GSM during the flight. By 2015, both Mobile OnAir and Internet OnAir will be installed on 25 Iberia A330s and A340s. Passengers on these long haul aircraft can use their phones and tablets to chat, tweet and send text messages. Last week the Airport Commission published four complex documents discussing the possibilities of a Thames Estuary hub joining the Gatwick and Heathrow shortlist. These covered ‘environmental impacts’ (232 pages), ‘operational feasibility’ (103 pages), 'socio-economic impacts' (112 pages) and ‘surface access’ (169 pages). Comments are required by 8 August. A decision on 'Boris Island' is expected during the autumn. The four reports all seem to come to one conclusion. BA has posted on its web site (but not as a press release) an important message concerning new security requirements from the UK and US Governments. All British Airways flights continue to operate as normal and the airlines advise's customers to arrive in good time for the various stages of their journey including check-in, main security search areas and at the boarding gate. Customers may be subject to additional searches and questions. Virgin Atlantic has confirmed that it will make a high profile Boston introduction for its first Boeing 787-9 Dreamliner on 28 October and fly six times a week from Heathrow. It is 30 years since Sir Richard Branson took Virgin Atlantic’s inaugural flight across the Atlantic from Heathrow to New York Newark on 22 June 1984. To celebrate this 30th milestone, the new 787 aircraft is named ‘Birthday Girl’ and features some very special paintwork. For the first time ever, the iconic Virgin Atlantic ‘Flying Lady’ will be displayed face on – and she is carrying a celebratory champagne flute! Reykjavik has been highlighted as easyJet launches nine new ex-UK services. Now the UK’s largest airline says that it has passed the 700 route milestone. A first stage report examining a new rail connection between Heathrow and the south of England will be published in November this year, the Department for Transport (DfT) has confirmed. The new study will build on Wandsworth Council’s feasibility work which suggests a new direct route to Waterloo via Clapham Junction and Vauxhall would be the best solution to a severe shortage of public transport links into the airport. Alison Chambers has been off on her travels. Thirty minutes’ flight time from Gatwick, four times daily now by Aurigny’s brand new Embraer 195 jet, and you can be in Guernsey, the second largest of the Channel Islands. Not quite abroad, but with its temperate climate, quiet beaches, strong heritage and a laid back style, it could easily be anywhere overseas English speaking. A really 'with it' Car! 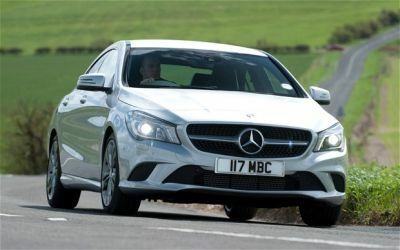 First sight of the new Mercedes-Benz CLA saloon got me even more excited than when I tested the new A-Class model. Yes, Mercedes-Benz has a very desirable and extensive car range but just recently it has really come up trumps with some mould-breaking new models. Cars are invariably categorised and to all intents and purposes I would suggest that this new model kicks off in the junior executive sector though considering Mercedes character I suspect that a really potent AMG version will eventually emerge as the car’s dynamics seem ideal for considerably more outright performance. Irish airline Aer Lingus (EI) has become the first non-Star Alliance carrier to move into the new Heathrow Queen’s Terminal (T2). Virgin’s Little Red, which it operates, will come across 10 September. Eva Air moved on 2 July, and Aegean will be in T2 from 23 July. Sri Lankan changes from Terminal 4 to Terminal 3 on 16 July. Air Astana is now planning to widen its European network with the addition of regular flights to Paris and to Prague in spring 2015, complementing established European routes from Frankfurt to Astana (daily) and Almaty to Amsterdam, six times per week. The Air France/KLM SkyTeam lounge at Heathrow Terminal 4 is now welcoming all passengers regardless of class and airline. The charge is £25 and is payable at the door. For the first time Farnborough this year will, in effect, be two shows. The trade fair – Farnborough International – starts today (Monday 14 July) until Friday, and the public offering – The Air Show – next Saturday and Sunday. June 2014 marked the second anniversary of operation as an independent airline for bmi regional. The carrier says it is set for sustained growth through 2014. Getting in early before the rush of orders (and what in truth are non-orders) during Farnborough week, Boeing and Emirates have finalised a commitment for 150 of the new 777X. First announced as a commitment at the 2013 Dubai Airshow, the order by the world’s biggest 777 operator was part of the largest product launch in commercial jetliner history. If you are in London next week and have an hour or two to spare Business Travel News can highly recommend The Guild of Aviation Artists' 44th Annual Summer Exhibition (21-27 July). Held once again at the Mall Galleries, actually in The Mall and close by Admiralty Arch, the exhibition will this year offer over 400 original works of art on display. Aurigny could be standing down its venerable Britten Norman (BN) Trislander aircraft for the twin-engined Dornier 228 and is expected to debut at London City Airport from September. Final planning consent has been given for a £100m development at Luton Airport. The work will increase annual passenger capacity from 12m to 18m by 2031 and should put behind it criticisms that it was not keeping pace with its London gateway rivals. A group of more than 100 delayed air passengers who came together on Facebook have finally received a pay-out of €600 each from air carrier Virgin Atlantic, prompted by last month’s landmark Huzar ruling at the Court of Appeal, in total over €600k.